Since DOI came out with the free gameplay and the lowered price from the steam store, there have been many new players. This is just to help clarify some things over. Most secondary weapons can be reloaded for an extra bullet in the beginning of a match, before the round starts (depending if that one bullet'll really help you or not); some sniper rifles work too, depending on the scope. If you and an ally have the same weapon, you can give that ally extra ammunition with your interact key when up close to them, depending whether you have some or not. The new Ammo Pouch, when dropped and interacted with, will also give extra ammunition (not for classes, however). Primary weapons with clips, when reloaded, will evenly distribute the rest of the ammunition (e.g. I shoot a bullet from a Grease gun and reload. Rather than that entire clip going to waste, I would still have the remainder). The American Garand, however, will use the entire clip, i.e. if one bullet is shot and I reload, the other seven bullets are gone for good, therefore I wasted an entire clip. Also same with revolvers. Bolt Action rifles will always reload bullet by bullet, so be smart when to reload. For bolt action rifles, if you have a speed clip loader, you will only use it if five shots are needed, i.e. you won't use if you shot three shots and reloaded, rather you'll just reload bullet by bullet again. If your tank of gas blew up, your flamethrower won't work (Yes, I've seen people confused by this before) Hint: Pick up a new primary. If you do not aim down sights with a machine gun, moving left and right will not be so fast, so be cautious. You cannot aim down sights on a machine gun when on your feet. For you loadout, if you have a rifle grenade equipped, you won't be able to equip other grenades from the loudout, but you'll be able to pick them up during the match. By default, left-clicking when holding a grenade will trigger the grenade to be thrown. If a timed grenade, the timer will start; helps to cook your grenades. By right-clicking, you'll get ready to throw the grenade, however the timer won't start ( you could see this especially with wehrmacht stick grenades, before throwing, you'll pull the string then throw). When tossing a grenade with V, the timer will not start, and you could get more control for a closer spot (might not want to do this with the impaction grenade). When throwing the impaction grenade, be thoughtful on your aim (right/left clicking does not affect this; it's impaction). Impaction smoke grenades will impact wherever, i.e. if it hits on a high wall, it'll be there rather than "drop down," so be careful not to waste. The Commonwealth Mills Bomb has quite a short timer, so be quick to throw (I usually never cook these grenades). 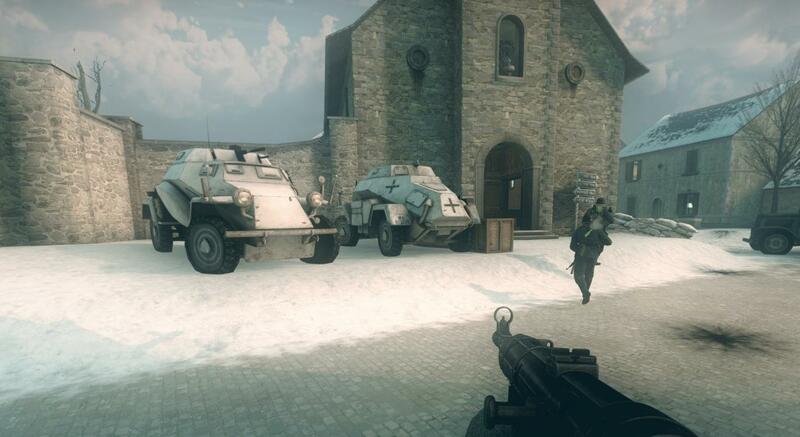 The Bazooka and panzerschreck are quite accurate, whereas the Piat and Panzerfäust you'll have to aim a bit higher. The Panzerfäust when used has only one usage, while the Piat, Bazooka, and Panzerschreck can have extra round. The Wehrmacht Einstoss is limited; be useful about it. Some other things, be aware when capturing objectives and such, don't stray away or do anything really dumb. Stuff I've seen is that many bad players join and then most experienced people just leave, and it's quite sad.